All transactions are safe and secure with a reliable history in online purchasing behind each of our associates. Buy the Rambo No Fear t-shirt to own Rambo clothing and merchandise. What would Rambo do? He would wear this cool tee, or he would use it to make a torch, wrap a wound, or fashion a new bandana. 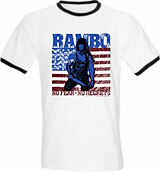 These colorful Rambo t-shirts display an image of Rambo standing in front of the American flag. Beneath him are the words, "No Fear, No Regrets". This attractive, patriotic Rambo t-shirt also displays the movie quote, "Want... for our country to love us as much as we love it." The quote is to the left of Stallone. In addition to the Rambo No Fear tee above, browse the Rambo Clothing Gallery for more apparel like men's and women's clothes, kids shirts or hoodies.